It’s December already, so time to respond to the second challenge of Doug Rocks-Macqueen’s ‘Blogging Archaeology’ – also known as a ‘blogging carnival’. I can only assume it’s called this because it will be bristling with tragically unfunny clowns, alcoholic freaks, and performers who were once, long ago, expected to do well, but whose wheels fell off at the first corner. Doubtless it will also be a spectacle that will leave a previously enthusiastic public feeling ripped off and forlorn. Anyway, time to don my spinning bow tie, have a few glasses, and see what repairs can be made to my chassis – this month’s theme? Matres (the Vertault relief), Vertillum (Vertault), Gaul. It wasn’t all that long ago that the only avenue to broadcasting available to the common man involved wearing a short cape, a side-cocked bi-corn hat, ringing a bell and bellowing a spittle flecked, inchoate, semi-glossolalic message, repeatedly, at an inordinate volume, to a startled public in the town square. Now, costumed in nothing more than a film of grime, an all-pervading yet paradoxically indefinable sense of loss and, in spite of the relentlessly accumulating evidence to the contrary, a nagging, fleeting hope that someday, one way or another, things may yet come good, they may chisel, butcher, craft and sculpt their missive into prose which approaches, yet maddeningly veers away from, the sentiment they wished to express to the reading world. Additionally, they are able to deliver their intelligence but once, instead of repeating it until their audience grows weary and disperses, rudderless, to continue the ceaseless pursuit of their next measure of distraction, in order to keep their minds from dwelling too long on the howling, inescapable void to which we must one day all succumb. It seems a certain Leanne Taylor may have been offended by the ‘Your Mother’ line (see comments). Leanne – This is for you. 1. Anyone involved would be so far removed that only an incalculably small fraction of their being could possibly claim injury. 2. We would actually be living in an ancestral tree. However, I feel that a further explanation is warranted, as you did indeed miss the point, but only through my own obtuseness, short attention span and the fact that supper was ready, as opposed to any shortcomings in your mental acuity. It was cauliflower cheese by the way. As you know, the challenge set down was to come up with a post about the ‘Good, the Bad, and the Ugly’ concerning blogging in archaeology. 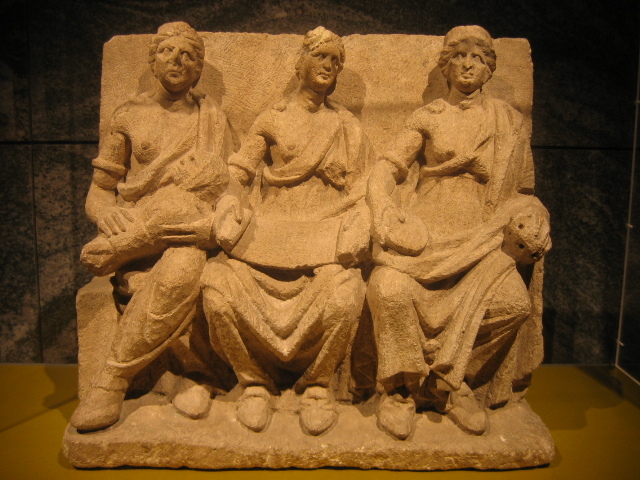 And seeing as the challenge took for form of a trinity, I thought I would invoke another trinity as the archaeological aspect of my reply, that of the Matres – the Classical female deities who most usually appear in triplicate. To make this relevant to the challenge I was then going to tie them into the Northern European version of the female trinity, that of the Maiden, the Mother and the Crone (or Hag). You see, the Maiden was supposed to be the Good, the Mother the (not) Bad and the Crone (or Hag) the Ugly. The superficial was an important part of this scheme, the conceit depending on the reader allowing the (not) Bad to go by without much argument, and also agreeing that the Crone (or Hag) would be Ugly. So the Good and the Bad were the same text repeated, to emphasise the rather glaring point that the Good and the Bad aspects of blogging could in fact be exactly the same. I know – I can see you scratching your head, but here’s the thing – the reason that this doesn’t really work – and I can’t emphasise this enough, even though the use of italics and bold text – is that part-way through writing the post I completely forgot about this scheme. So for the Good and (not) Bad to be the same, I had to make them both not Bad, even though the opposing notions were the central point to the question. The Good, The Good, and the Ugly doesn’t work in the context of this month’s challenge. Anyway, the third reply consisted of the word ‘Your Mother’ because the third aspect of the trinity is the Crone (or Hag), who is the Ugly, and represents the ugly side of blogging, which is the negative comments one can receive in the comments section, such as suggestions that your mother is no statue, unlike the mothers featured in the image. But she also represents all mothers, and this was supposed to be really clever, in ways I can no longer clearly remember. Your Mother – Our Mother – All Mothers – representing The Ugly Side of Blogging. I know – I just read that too, and I was there, and it’s still rubbish. It’s like someone showing you a map with all the right colours on it, some lovely contour lines and even an ox-bow river. But when you ask the cartographer where it is a map of, he just slaps his fore-head and says ‘Ohhhhh’. But Leanne, and again I can’t emphasise this strongly enough, even through the use of italics and bold text, I left it as it was because it ever so slightly worked, and that the Your Mother bit would elicit a small gasp, a smile, or nothing at all, but not result in any lasting damage, and because I am very fond of cauliflower cheese. Dear Leanne – my apology and explanation ran into so many words that it actually outstripped the original post. Instead of including it here, I have in fact added it to the original, and humbly hope it will suffice. Thanks for such a lengthy explanation – I feel a bit bad now. I’m fairly new to arch, and to your blog, so please forgive me for getting the wrong end of the stick. After spending some time looking through your previous posts, I now look forward to future blogs, and promise not to get offended again. Can’t promise to always know what you’re on about though. Not even sure you do ;). Oh, you got my name wrong on your facebook post, btw (unless you’ve upset another Leanne as well?). It’s ok, I’m not offended. No long blog addition necessary ;). I am desolate. I think I’m just going to stop now. Anyway, what do you think of me so far? Impressed? but not once did you mention Morricone… , as opposed to the Morrigan, who you have obliquely referenced. As for the Wholly Trinity , is that not covered by Pie Thagorus, his lovely daughters and his cousins on the other two sides?? (You can work it out online with an E-Quation…remember that x = the amount of cauliflower required to fuel a single archaeologist to a depth of three feet, given a three square feet perimeter and appropriate footware, where y is the response to :”let s open up another ditch”) i rest my trowel.